Closely related to the hygienic factor of Exercise and Rest is that of Sleep and Wakefulness; both help us to maintain a balance in our daily routine and activities. For what is sleep but a more profound state of rest, and what is wakefulness but the state within which exercise and activity can take place? The ancient Greeks were great believers in the restorative power of sleep and rest. 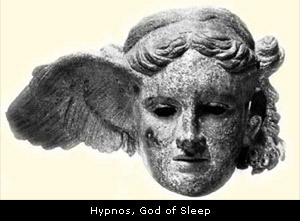 Hypnos, their god of sleep and dreams, was seen as the remover of all pain, suffering and sorrow. Sleep is necessary to allow the anabolic processes the opportunity to restore and regenerate the organism and its vitality. What sleep does for the body, dreams do for the mind. Dreams enable the mind to regenerate itself and work off all the stresses, problems and tensions of the preceeding day. When we get sleepy, sweet, warm, moist Sanguine vapors rise from the heart to the head, and one starts to yawn, sigh and get drowsy. Sleep then starts to overcome us, and the senses start to interiorize; we close our eyes and fall asleep. As the quiescence of sleep deepens, the Sanguine warmth starts to cool off, the metabolism slows down, and the circulation interiorizes to warm the body's core. And so, the nature of sleep is cold, wet and Phlegmatic. Wakefulness has the opposite nature. Its activity is Hot, and in consuming the nutritive and caloric reserves of the organism, wakefulness is Dry. This gives wakefulness a Choleric nature and temperament. Wakefulness is like a flame that consumes the vital nutritive reserves of the organism. To remain healthy, we need to maintain a balance between Phlegmatic sleep and Choleric wakefulness. Excessive sleep and somnolence makes one too sluggish and Phlegmatic. Excessive wakefulness makes us too tense, hyperactive and Choleric. Excessive sleep breeds more Phlegmatic somnolence; excessive wakefulness breeds mor Choleric restless activity. And so, a vicious cycle is created. The nature of sleep is basically the same as that of rest, except that it is deeper and more profound. And the nature of wakefulness is basically the same as that of exercise, except not so vigorous and active. Sleep is restorative and anabolic. The more healing, growing and regenerative work the organism needs to do, the more sleep it will need. Children and youths, whose bodies are still growing, need more sleep than adults, who have stopped growing, since growth is anabolic. The more inherent moisture and Radical Moisture you have in your constitutional makeup, the better you will be able to sleep. And so, the wet or moist temperaments - Sanguine and Phlegmatic - are generally the most sound sleepers. Of all the Four Temperaments, the Phlegmatic temperament - the most passive and Yin, and the wettest and most anabolic - is generally the heaviest sleeper. They may even be prone to excessive sleep and somnolence. They also tend to be the heaviest snorers, since the great inherent moisture of their constitutions greatly relaxes the tone of the soft palate, producing excessive snoring. In the Sanguine temperament, which is moderately moist, and not as wet and anabolic as the Phlegmatic, sleep is sound and balanced, but not excessive. There may be some snoring, but it, too is not excessive. Insomnia and sleep disorders tend to occur most frequently in the two dry temperaments - Choleric and Melancholic. However, the two differ in their respective patterns of sleep disturbance. The Choleric pattern is to have no trouble falling asleep, but to then suffer from restless or fitful sleep, tossing and turning all night. Cholerics may wake up in the early morning, between 2 and 3 AM, and have a hard time going back to sleep. The Melancholic pattern is to have a hard time falling asleep, and then not sleep very deeply or soundly even when they do sleep. Melancholics also have a tendency to wake up too early in the morning, thus robbing themselves of a full night's sleep. Insomnia is most common in Melancholics, who also tend to be the lightest sleepers. Insomnia and sleep disturbances can also arise from acquired conditions and aggravations of humor and temperament, usually of a Choleric or Melancholic nature. Cholerically, digestive disturbances, generally of a bilious nature, can disturb sleep from eating too heavily for dinner, and too late at night or too soon before retiring. Melancholically, staying up too late at night, or not eating regularly or sensibly for adequate nourishment, can lead to insomnia and sleep disturbances. Excessive anxiety and stress, as well as the abuse of caffeine and other stimulants, can also cause sleep disturbances. The daily circadian cycle is divided into four six hour periods, with each one having a different nature and temperament. The temperaments of these different periods need to be respected. The six hour period surrounding noon is the period of maximum light, heat and activity; its temperament is Choleric. Accordingly, one should remain active at midday, from 9 AM to 3 PM, and not sleep or nap during this period. Conversely, the opposing six hour period surrounding midnight, from 9 PM to 3 AM, is Phlegmatic, being the coldest, darkest and most passive/quiet period of the day. Accordingly, one should be either sleeping or winding down the day's activities to a close during this period. For the sake of one's health, one should start winding down at 9 PM and try to get to bed by 10 PM or not long thereafter. Going to bed later than this aggravates nervous tension and fatigue. The other two six hour periods between these two polarities are transitional periods, and surround sunrise and sunset, which are the transitions between daytime and nighttime. The Sanguine period, surrounding sunrise, is the period of awakening. The Melancholic period, surrounding sunset, is a period of a gradual tapering off of the day's activities and the shift to a more quiet, contemplative evening mode. One should wake up from sleep during the Sanguine period, and not any later; most people wake up around sunrise or within a couple of hours thereafter, between 6 and 8 AM. Sleeping beyond 9 AM, or the end of the Sanguine period, will leave one sluggish and somnolent throughout the rest of the day. Waking up too long before sunrise will rob one of the restful sleep one needs to start the day fully refreshed and revitalized; worst of all is waking up before 3 AM, or the start of the Sanguine period. Daytime napping is generally not recommended according to Greek Medicine. Worst of all is napping during midday, which can really throw your circadian rhythms off kilter. If you must take a daytime nap to make up a sleep deficit, it's much better to take one after 3 o'clock in the afternoon, during the transitional Melancholic period. After taking an afternoon nap, one can again compensate by staying up a little bit later than usual. There is no greater boon to good health than sound, restful sleep. Therefore, we should take whatever measures are necessary to assure that we get it. Some of these measures involve adjustments in our eating and lifestyle habits, whereas others are tonics or remedies for sound, restful sleep. The general rule is to make the required adjustments to one's eating and lifestyle habits first, and when these alone are insufficient, to resort to tonics and remedies, always trying to use the gentlest one that will produce the desired result. Using a sleep medicine that's too strong will leave one groggy and hung over in the morning; Luckily, there are plenty of natural remedies that are safe, gentle and effective. Eat lightly for dinner, at least three hours before retiring. Eat light, easy to digest foods, and stay away from heavy meats and proteins, rich creamy sauces, greasy or fried foods, or hot, spicy dishes. Don't overwork or stay too late at the office. Try to release the cares of the day's business and leave them at the workplace. Take an easy stroll either half an hour before dinner, to work up an appetite, or an hour or two afterwards, to work off stress and help you digest your food. Do some light stretching or yoga before bedtime. Meditate, say your prayers, or do your devotions for about 15 minutes or so before retiring, to release the day's cares and put everything in the hands of a Higher Power. Put on some soothing, relaxing music, lie down on the bed and do some deep abdominal breathing; this will prepare you for sleep. Melancholic type insomnia is usually caused by staying up too late, as well as excessive exercise, stimulation or activity late in the evening, or in the nighttime. This leaves one unable to wind down, relax and get to sleep. First of all, one should eliminate the cause by stopping all these excessive nocturnal activities. You should also make sure that you're sticking to a well-regulated meal schedule, and that you're getting adequate nutrition in your diet. Those in the Sanguine life stage of youth, in which the Radical Moisture is most abundant and the organism is at its most resilient, generally have the easiest time getting adequate sleep or coping with a sleep deficit, in spite of odd hours or burning the candle at both ends. Our tolerance level and ability to bounce back from sleep abuses or deprivation declines as we age, especially in middle age and beyond. When the above suggestions alone are insufficient to induce the sound, restful sleep you need, then tonics and remedies become necessary. For milder cases, this may be nothing more than a simple, relaxing nightcap. A small glass of wine, or sipping on a cup of hot milk before bedtime may be all that's needed. Relaxing herb teas to drink before bedtime include Camomile, Linden flowers, or St. John's Wort. And of course, eliminate all caffeine and caffeinated drinks like coffee and cola, especially in the afternoon and evening. If you're having a hard time sleeping due to indigestion, you first need to settle your stomach by making an herbal tea from Hops (Humulus lupus) and drinking a cup. If it's too bitter, you can sweeten it with Fennel. Also, chewing on a few pieces of Calamus root (Acorus calamus) will settle the stomach and help you to relax. You may make the basic sleep-inducing nightcap of hot milk more elaborate, and more powerful, if you wish. The simplest enhancer is simply to heat it up with a half teaspoon or so of powdered Nutmeg, which also has relaxing, sleep-inducing properties; the Nutmeg also cuts through the cold, wet, phlegm producing properties of the milk. Or, you may wish to make a milk decoction of Valerian root (Valeriana officinalis) sweetening it with a little Cinnamon to mask the foetid odor. Take a rounded tablespoon of Valerian root and put it in a pot with one cup of water and one cup of milk. Throw in a stick of Cinnamon, or about 1/4 teaspoon of the powder. Bring it to a boil and simmer it slowly, until its volume is reduced by about half. Strain and drink. If you have too much phlegm, you may wish to eliminate the milk and just use water, to make just a plain decoction of Valerian root. This also works well. Or, you may want to take your Valerian root in capsule form, to avoid the foetid taste and odor. An excellent American nerve tonic is Ladies' Slipper root, or Cypripedium arietinum. Take it in capsule or tincture form, similar to Valerian, to restore the nerves and help you sleep. Because it is a gentle restorative to the nervous system, it may be taken on a daily basis for strengthening constitutional resistance to insomnia. When Valerian root alone is not enough, there are other sleep remedies that are stronger. You can make an infusion from the petals of the Red Poppy (Papaver rhoeas), and drink that before bedtime. It's a relative of the Opium Poppy (Papaver somniferum), but milder, safer and non-addictive. Those living in Europe may be able to get a hold of some European Mandrake root, which is an excellent sleep remedy, and stronger than Valerian. Chew on a few pieces of the root before bedtime for sound, restful sleep. The European Mandrake root, Mandragora officinalis, should NOT be confused with American Mandrake root, which is Podophyllum peltatum. American Mandrake is a very strong, harsh purgative that should only be taken under the supervision of a holistic healthcare professional. I have not seen any European Mandrake root available in the United States, and never saw or tasted any until I visited Greece. If you wish to be more traditionally Greek in your relaxing nightcap, try drinking a cup of Lemon Verbena tea (Aloysia triphylla), sweetened with a little honey if you prefer. The Greeks call it Luiza. What if you have the opposite problem of excessive sleepiness, or somnolence? This often indicates an excess or aggravation of the Phlegmatic humor. Then, it's necessary to go on a phlegm reducing regime. If the sleepiness or drowsiness comes on after meals, there is usually excess phlegm in the stomach and digestive tract. Go on a phlegm reducing diet and take herbs to stimulate and warm the digestion and remove excess phlegm and dampness from the stomach and digestive tract. These include Ginger, Fennel, Cardamom, Patchouly, Juniper berries and Magnolia bark. Sometimes, there can be sluggishness and grogginess around the clock, with an inability to either sleep soundly and fully, nor an ability to be fully energetic and active during the day. There may also be an oppressive, bearing down sensation in the chest, around the heart, because phlegm is obstructing the heart. Cardiac tonics like Saffron, Angelica root and Linden flowers are needed, as well as Camp9hor or Snake root, which can clear up this excess phlegm. Perhaps the most common cause of excessive somnolence during the daytime is going to bed too late at night, or getting too little sleep. Early to bed and early to rise is best.